Fiberglass tanks are an excellent choice for fertilizer storage, mixing, processing and production. Fiberglass holds several advantages over competing materials. The exterior of GPI tanks is impregnated with gelcoat and a UV inhibitor, which means that it will never require sandblasting or repainting. This provides a significant value over the life of the vessel. The corrosion resistant nature of fiberglass allows for an extended service life of the vessel (with proper maintenance and regular inspections). If damage does occur to a vessel, fiberglass can easily be repaired. 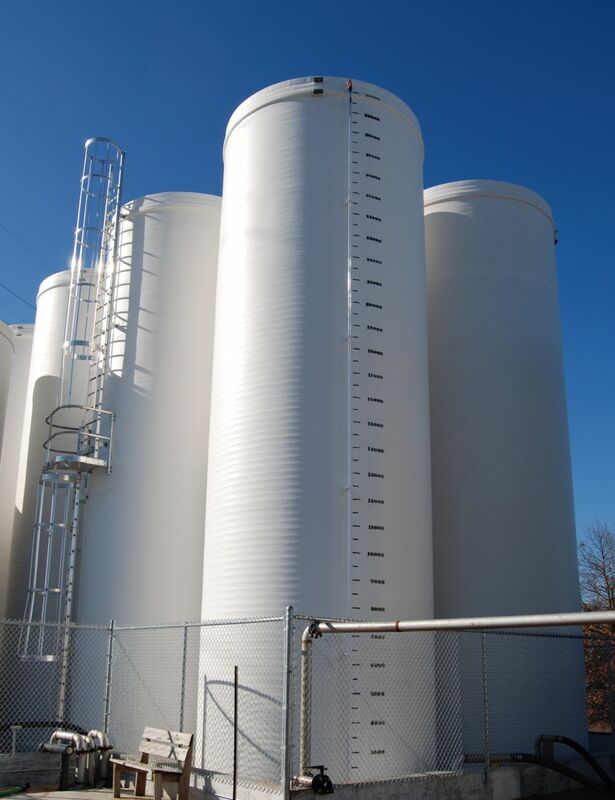 Fiberglass tanks can also be constructed with abrasion resistant resins, which makes them suited for feed and seed storage and mixing. 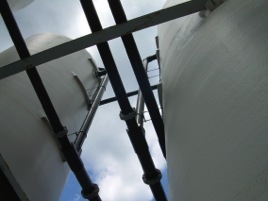 Fiberglass is an excellent choice for many processes in the treatment and containment of wastewater, including secondary systems for chemicals used in the treatment of wastewater. 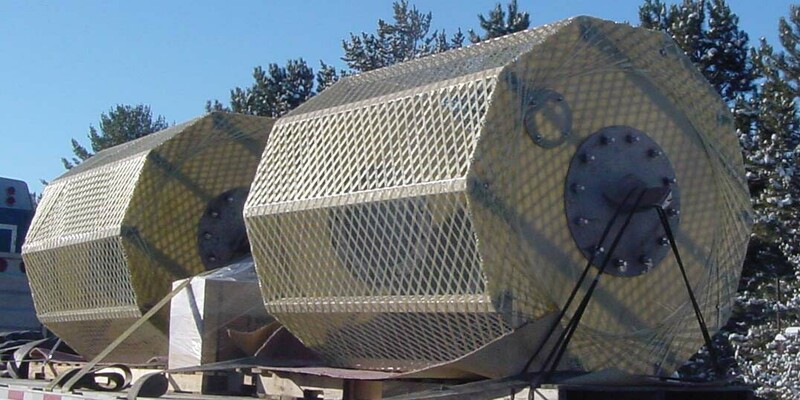 GPI has manufactured vessels for municipal wastewater applications as well as for process systems treating industrial waste streams. We also manufacture Rotating Biological Contactors (RBC). RBCs efficiently treat larger volumes of wastewater than competing systems and RBCs can be added to existing treatment facilities to increase volume. If you have a wastewater or water application requiring storage or treatment, contact the GPI team. Also, we would be happy to discuss the design advantages of our RBC units. GPI has manufactured a variety of fiberglass scrubbers and stacks for air pollution control and odor control. 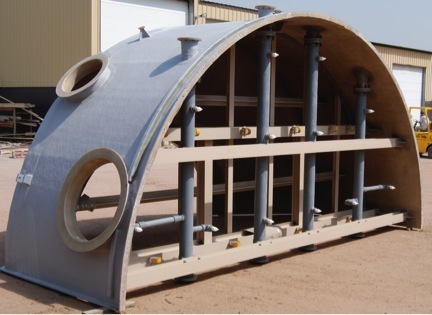 We have the capacity to manufacture 17’ diameter vessels in house and much larger sectional vessels that we can assemble on-site. During the manufacturing process we can install any interior structures that may be required, such as platforms, piping or packing material. If you have an air pollution control application, please contact the GPI team for a quote. GPI has manufactured vessels for coal power plants, nuclear power plants, ethanol production facilities, and biomass plants. Fiberglass vessels can be utilized at various points in energy production stream, including pollution reduction technologies and water-cooling systems. We are proud of our contribution to many technologies at the cutting edge of power generation. Fiberglass is an excellent choice for many applications in the food processing and food ingredient markets. GPI can utilize FDA approved resins for food and beverage storage. Fiberglass vessels are also easy to clean and to repair. GPI has manufactured vessels for numerous food-processing corporations, including many corporations who produce goods that are likely in your refrigerator! If you require storage or processes equipment for the food processing industry, contact the GPI team for a quote.